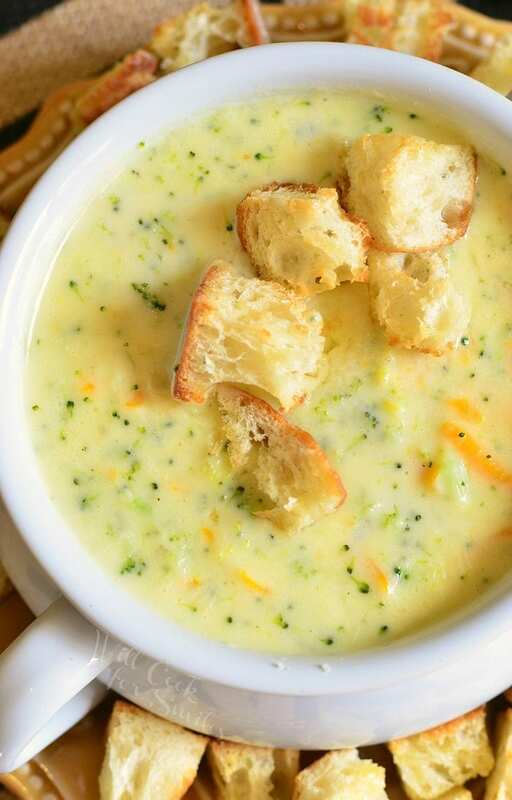 Divine variation of a classic broccoli cheese soup. 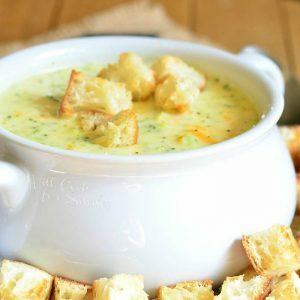 This comforting, homemade soup is made with two flavorful cheeses, sharp white cheddar cheese and Asiago cheese. 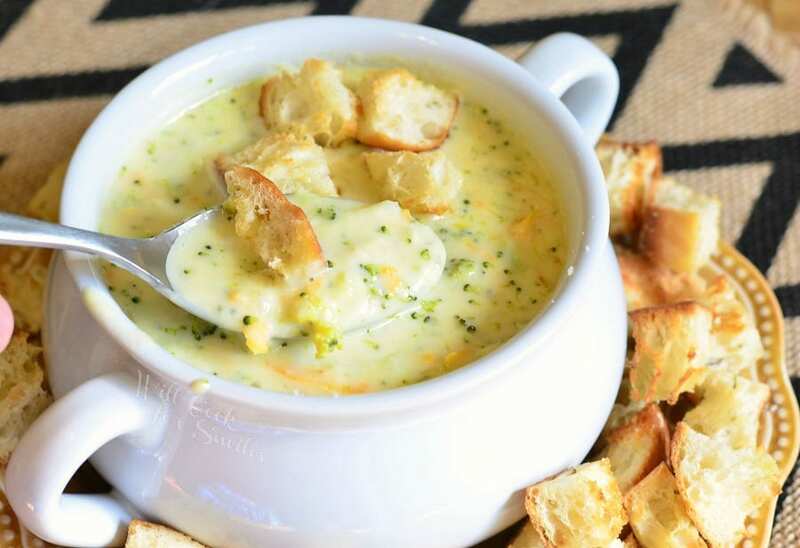 This is just what I wanted, a big bowl of delicious broccoli cheese soup that’s bursting with flavor from Asiago cheese, sharp white cheddar cheese, and homemade cheesy croutons. I’ve been craving this soup for so long. Too long. 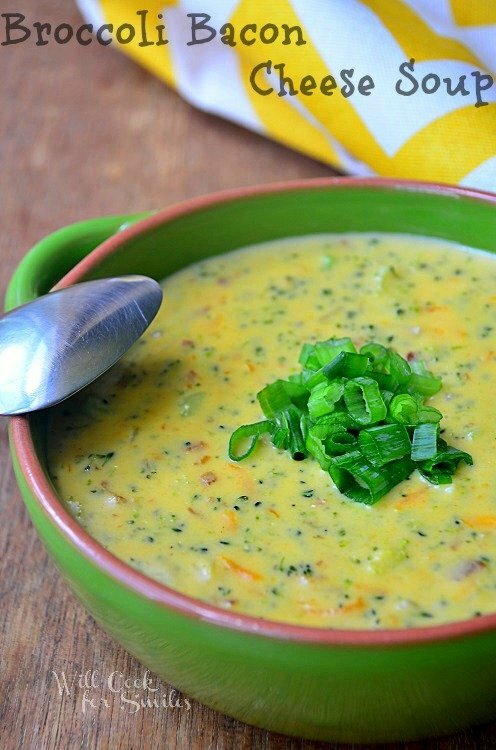 I had a very unfortunate experience with a Asiago Broccoli Cheese Soup and I could not rest until I tasted exactly what I expected. 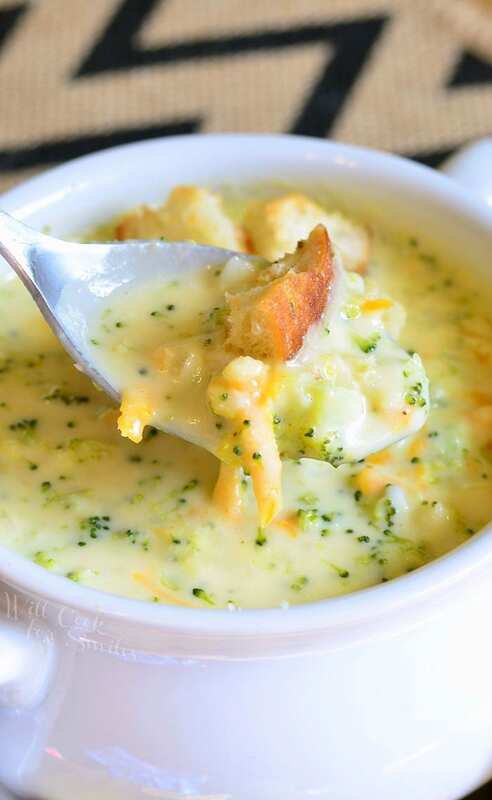 A restaurant that we all like very much had a new item on their menu, Asiago Broccoli Cheese Soup, as you may have guessed. It sounded amazing and all I wanted was a big bowl of it for lunch. Finally we got our food, I take a bite and …nothing! It literally tasted like a big, fat nothing. The taste seemed like it was broth, thickened with some flour, added broccoli and a faint touch or flavorless cheese. I was so disappointed, I almost cried. (I did say “almost.” Last time I cried over food, I was pregnant.) After two bites of this “nothing” soup and I couldn’t eat it. All I could think of is making it at home, just the way I imagined it would taste like. I mean common, if you are going to put a flavorful cheese like Asiago into a dish, it should taste that way. I imagined this soup to be bursting with flavorful cheese and that’s exactly the way it came out when I made it at home. Nothing but flavor here, baby! I also paired it with simple, cheesy croutons that can be made while soup is cooking. 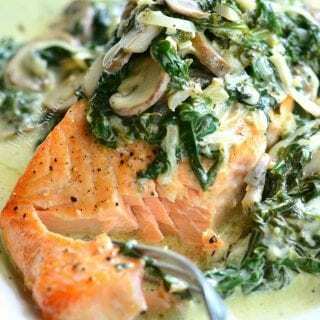 This whole dish shouldn’t take more than 30 minutes and you will definitely enjoy the results! 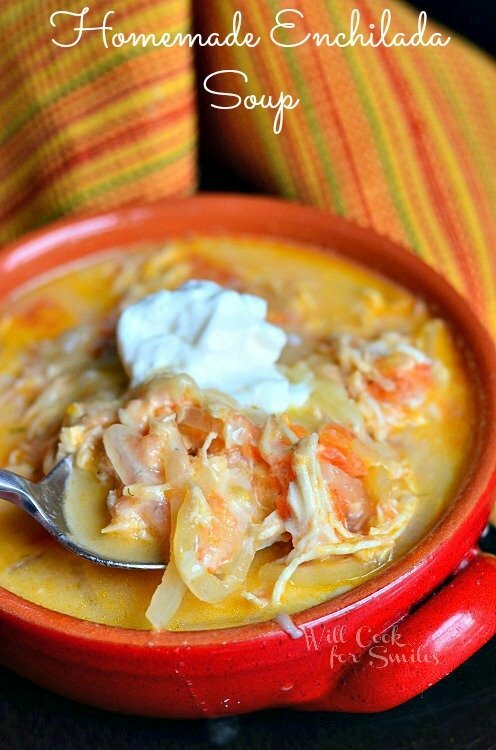 This comforting, homemade soup is made with two flavorful cheeses, sharp white cheddar cheese and Asiago cheese. In a medium pot, heat up oil over medium heat. Add diced onion and shredded carrot. Saute until onion is transparent. 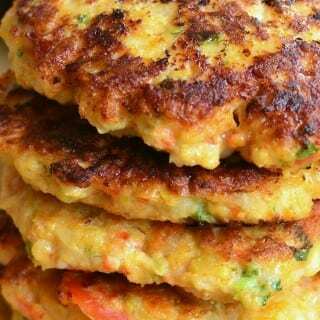 Sprinkle flour and mix until veggies are coated with flour. Slowly pour in vegetable broth while constantly stirring. Add heavy cream and stir. Let soup heat through (still on medium heat.) Once it starts to boil, start adding cheeses. Add pressed garlic, salt and pepper to taste. Stir in broccoli. Lower the heat to medium low, cover and cook for about 7-10 minutes, stirring occasionally. Croutons: (I didn't put measurements for a reason, because you can make as few or an many as you want and it just requires a drizzle of olive oil and sprinkle of salt and cheese.) Preheat oven to 325. Cut bread into 1/2 inch cubes and place them in a mixing bowl. Drizzle some olive oil. add some salt and grated Asiago cheese. Mix well until all bread cubes are evenly coated. 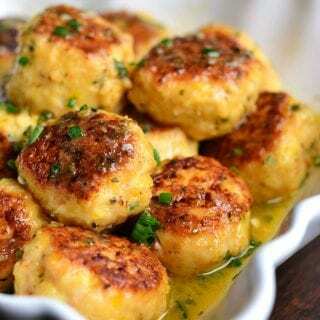 Spread on a baking sheet and bake for 10-15 minutes, until crunchy and golden. 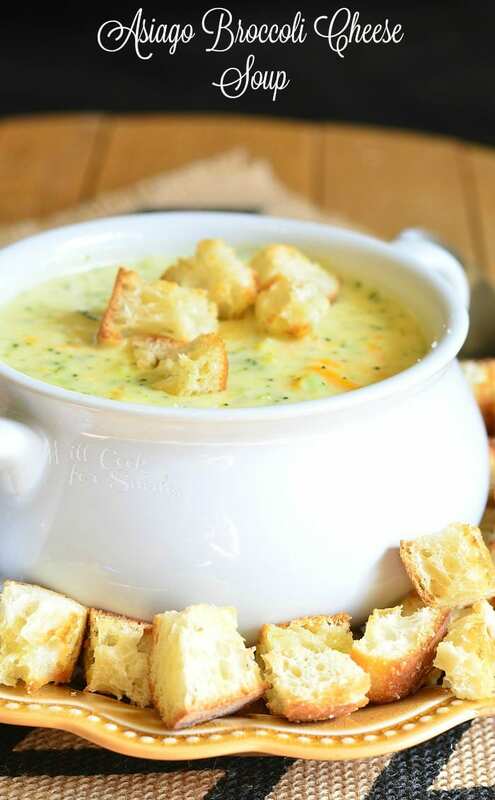 Top each bowl of soup with some grated Asiago cheese and croutons. We were never really a soup eating family, but, I think we are turning the corner. Thank you so much, Kathleen! I hope you’ll try it soon! I had to add more cream/broth/cheese because when it was supposed to be done, there was very little in my pan. I’m only cooking for two and the regular amount of specified ingredients would not have been enough. But other than that, delicious! 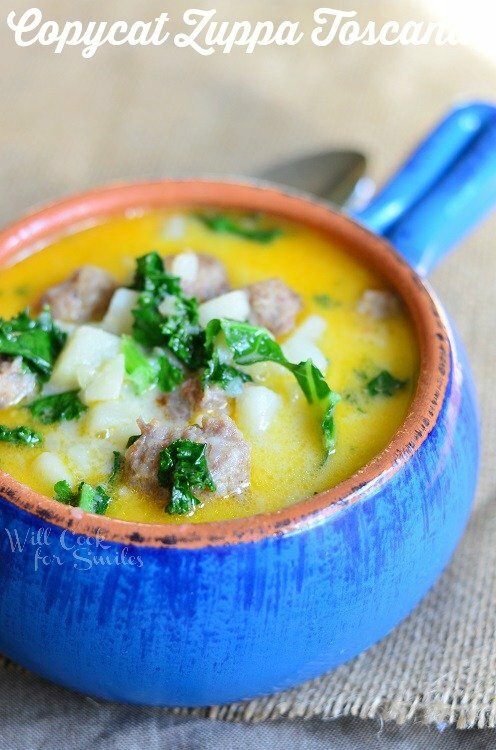 An absolutely delicious soup! 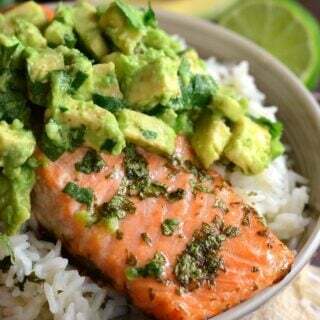 It requires some attention while cooking, but it’s easy to make. I pre-chopped and pre-shredded everything that needed it, so it came together fast when I was ready to cook. I did not mince the broccoli, because I prefer to have bite sized chunks of broccoli in it. 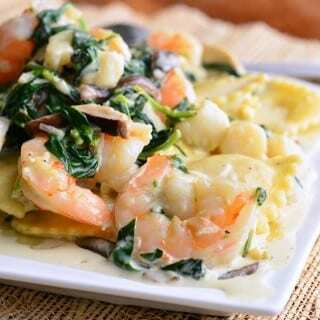 It was out of this world delicious and perfect served with a Caesar salad. Next time I may just have to double the recipe. 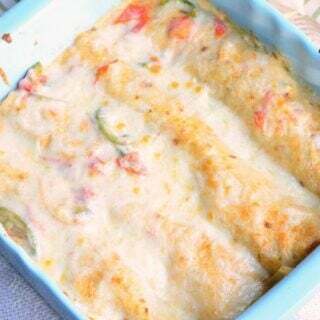 I made this twice last week…it was so GOOD! Just wondering: Would you think chicken broth, and sharp cheddar cheese would work in this dish. Only asking because I usually always have chicken over vegetable and sharp over white in the house. We always have asiago and parmesan so not worried there. My husband is the cook but ever since he has stopped being self-employed and went back to 9-5 style jobs I am having to cook now. 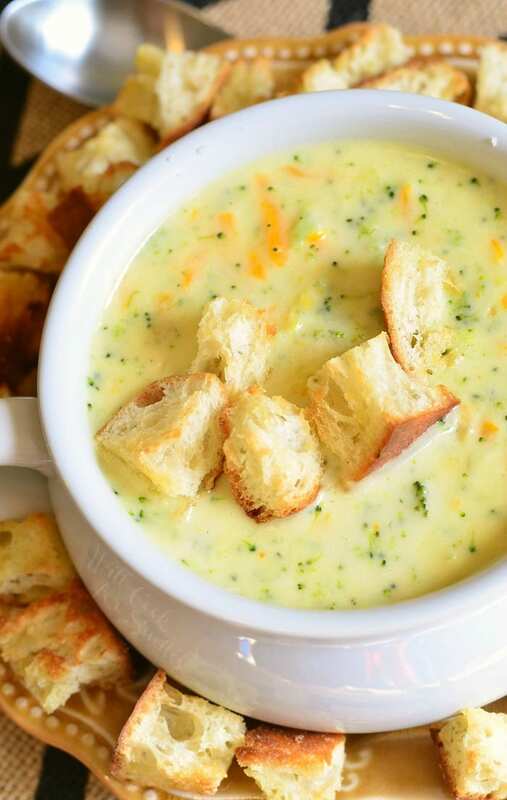 Thankfully I have always spent my time in the kitchen watching my mom and husband, but my husband loves broccoli cheese soup and he makes an awesome one. I would love to try this one and surprise/impress him with this, lol. Especially since he loves asiago and is the reason we always have it. You can definitely use chicken broth. The flavor difference between veggie broth and chicken broth is not very big, so as long as you don’t use beef broth, you are just fine. Sharp cheddar will work as well. I’d just stick to the block rather than shredded because shredded cheese is normally coated in corn starch and will add to thickness of the soup. I really hope you guys will like it! China tours made out trip very enjoyable.